stores 50 meters apart in the heart of TEL-AVIV. 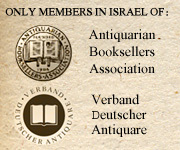 antiquarian travel books to the Holy Land, the arts and history. Antiquare” and as such obliged to their code of ethics.